Cauliflower, like its close relatives broccoli, kale, and cabbage, provides many nutrients and health-promoting compounds. And with only about 5 grams of carbohydrates in 1 cup, cauliflower is also an excellent choice for a low carb diet. The best methods for cooking cauliflower include roasting, stir-frying or sautéeing, lightly steaming, or microwaving. Cauliflower can be boiled, but that will reduce some of the nutritional benefits and can leave the florets mushy. From soups and casseroles to roasted cauliflower and simple combinations, you're sure to find a recipe from among these favorites. 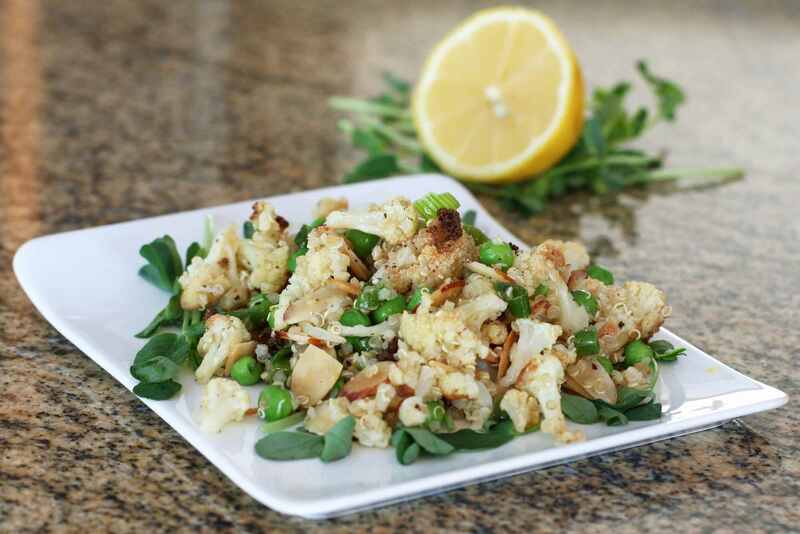 Roasted cauliflower and quinoa salad is a delicious dish that is easy to make. A simple fresh lemon juice dressing flavors the salad and while almonds give it some nice crunch and texture. This roasted cauliflower with cheddar sauce is a tasty way to enjoy cauliflower, and it's a super easy dish to prepare. The cauliflower is roasted in about 25 minutes while you make the quick and easy cheddar cheese sauce. Serve as a side dish with an everyday family meal, or serve as a holiday dinner side. A basic white sauce with Parmesan cheese makes this broccoli and cauliflower casserole a flavorful side dish. This dish is perfect for any everyday family meal, and it's special enough for a holiday table or potluck. This is a delicious main dish combination of cauliflower and sausage roast with cheddar cheese, and it's a breeze to prepare. The sausage and onions are briefly sautéed, then they're tossed with the seasoned cauliflower and roasted to perfection. A topping of Sharp Cheddar cheese finishes the dish beautifully. Serve the dish with a light tossed salad or sliced tomatoes for a satisfying family meal. With only about 5 carbs per cup, this mashed cauliflower makes a great replacement for high carb mashed potatoes. Add chives, parsley, and sour cream to the cauliflower for extra flavor. This curry-spiced roasted cauliflower soup is creamy and delicious. For a pleasant tang, add a bit of lime juice and top with cilantro or green onion. This makes a fabulous lunch soup with sandwiches, or serve as a soup course with a large meal or holiday feast. A creamy cheddar cheese sauce transforms plain steamed cauliflower into an irresistible side dish. The dish takes less 15 minutes to prepare and cook, making it perfect for a busy day. This roasted cauliflower with parmesan cheese is a tasty and easy way to enjoy fresh cauliflower. The cauliflower florets are tossed with a savory mixture of garlic and Parmesan cheese then roasted to perfection. Serve this easy roasted cauliflower as a side dish with an everyday family meal or make it for a holiday dinner or potluck. This delicious cauliflower and potato soup with cheddar cheese is rich and creamy, with plenty of flavor from the cauliflower, potatoes, and sharp Cheddar cheese. A little nutmeg and cayenne pepper are used to season this hearty soup. Garnish with herbs or a drizzling of roasted red pepper puree or flavor infused extra-virgin olive oil. This easy and tasty casserole is an excellent way to enjoy cauliflower, and it makes a wonderful addition to the dinner table. Steamed cauliflower and cheese bake is combined with a Dijon mustard flavored cheddar cheese sauce, then it is baked with a buttery breadcrumb topping. Curry powder and cilantro add flavor to this easy roasted cauliflower recipe. Make this curry roasted cauliflower to serve as a side dish or make it for a healthy snack. It's quick and easy, and everyone will love it! Green onions, cheese, and red bell pepper make this a festive and flavorful choice for a holiday meal or family dinner. Buttery breadcrumbs are added to crunchy topping on this cauliflower casserole recipe.